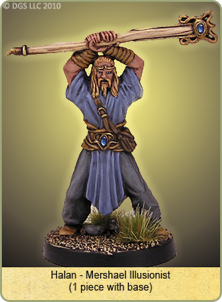 DGS Games have posted photos of painted examples of their Spellcaster miniatures. From their announcement: DGS has recently updated their webstore with pictures of painted caster figures. While these figures were released earlier, these painted images were just made available this week. So if you are looking for new caster or sorcerer figures for your gaming, or are just curious, then check these out. Halan – Mershael Illusionist Things are never what they seem with Halan the Illusionist. Or maybe they are… This master of shapes and sounds and shadows interlaces reality and phantasm like a master weaver, as much artist as caster. Zuuxur – Kandoran Necromancer A master of the game of Kuzkor Krex and popular with the masses, Zuuxur hears his name cheered loudest when entering the Necroseum. His command of the ways of the recently dead and his superior battle tactics make him a Necromancer with few peers. Juron – Falkaaran Fire Wizard (see picture on website DGSGames.com Juron serves day to day as the advisor to his brother, the Archbaron of Tlhar. It is known that he is a Caster of some power, but his abilities are the subject of rumor and speculation. What is not known commonly is that he is the High Wizard of Falkaar, and serves on the Council of Five.